Rickettsia is a genus of nonmotile, Gram-negative, non-spore-forming, highly pleomorphic bacteria that may occur in the forms of cocci 0.1 μm in diameter, rods 1–4 μm long, or threads of up to about 10 μm long. The term "rickettsia" has nothing to do with rickets, which is a deficiency disease resulting from lack of vitamin D; the bacterial genus Rickettsia was named after Howard Taylor Ricketts, in honour of his pioneering work on tick-borne spotted fever. Rickettsia conorii is a Gram-negative, obligate intracellular bacterium of the genus Rickettsia that causes human disease called Boutonneuse fever, Mediterranean spotted fever, Israeli tick typhus, Astrakhan spotted fever, Kenya tick typhus, Indian tick typhus, or other names that designate the locality of occurrence while having distinct clinical features. It is a member of the spotted fever group and the most geographically dispersed species in the group, recognized in most of the regions bordering on the Mediterranean Sea and Black Sea, Israel, Kenya, and other parts of North, Central, and South Africa, and India. The prevailing vector is the brown dog tick, Rhipicephalus sanguineus. The bacterium was isolated by Emile Brumpt in 1932 and named after A. Conor who, in collaboration with A. Bruch, provided the first description of boutonneuse fever in Tunisia in 1910. After an incubation period around seven days, the disease manifests abruptly with chills, high fevers, muscular and articular pains, severe headache, and photophobia. The location of the bite forms a black ulcerous crust (tache noire). Around the fourth day of the illness, a widespread rash appears, first macular and then maculopapular and sometimes petechial. Photophobia is a symptom of abnormal intolerance to visual perception of light. As a medical symptom, photophobia is not a morbid fear or phobia, but an experience of discomfort or pain to the eyes due to light exposure or by presence of actual physical sensitivity of the eyes, though the term is sometimes additionally applied to abnormal or irrational fear of light such as heliophobia. The term photophobia comes from the Greek φῶς (phōs), meaning "light", and φόβος (phóbos), meaning "fear". Photophobia is a common symptom of visual snow. The diagnosis is made with serologic methods, either the classic Weil-Felix test (agglutination of Proteus OX strains ), ELISA, or immunofluorescence assays in the bioptic material of the primary lesion. Agglutination is the clumping of particles. The word agglutination comes from the Latin agglutinare. The enzyme-linked immunosorbent assay (ELISA) is a commonly used analytical biochemistry assay, first described by Weiland in 1978. The assay uses a solid-phase enzyme immunoassay (EIA) to detect the presence of a ligand in a liquid sample using antibodies directed against the protein to be measured. The ELISA has been used as a diagnostic tool in medicine, plant pathology, and biotechnology, as well as a quality control check in various industries. Immunofluorescence is a technique used for light microscopy with a fluorescence microscope and is used primarily on microbiological samples. This technique uses the specificity of antibodies to their antigen to target fluorescent dyes to specific biomolecule targets within a cell, and therefore allows visualization of the distribution of the target molecule through the sample. The specific region an antibody recognizes on an antigen is called an epitope. There have been efforts in epitope mapping since many antibodies can bind the same epitope and levels of binding between antibodies that recognize the same epitope can vary. Additionally, the binding of the fluorophore to the antibody itself cannot interfere with the immunological specificity of the antibody or the binding capacity of its antigen. Immunofluorescence is a widely used example of immunostaining and is a specific example of immunohistochemistry. This technique primarily makes use of fluorophores to visualise the location of the antibodies. The illness can be treated with tetracyclines (doxycycline is the preferred treatment), chloramphenicol, macrolides or fluoroquinolones. Tetracyclines are a group of broad-spectrum antibiotic compounds that have a common basic structure and are either isolated directly from several species of Streptomyces bacteria or produced semi-synthetically from those isolated compounds. Tetracycline molecules comprise a linear fused tetracyclic nucleus to which a variety of functional groups are attached. Tetracyclines are named for their four ("tetra-") hydrocarbon rings ("-cycl-") derivation ("-ine"). They are defined as a subclass of polyketides, having an octahydrotetracene-2-carboxamide skeleton and are known as derivatives of polycyclic naphthacene carboxamide. While all tetracyclines have a common structure, they differ from each other by the presence of chloride, methyl, and hydroxyl groups. These modifications do not change their broad antibacterial activity, but do affect pharmacological properties such as half-life and binding to proteins in serum. Doxycycline is an antibiotic that is used in the treatment of infections caused by bacteria and certain other parasites. It is useful for bacterial pneumonia, acne, chlamydia infections, early Lyme disease, cholera and syphilis. It is also useful for the treatment of malaria when used with quinine and for the prevention of malaria. Doxycycline can be used either by mouth or intravenously. Chloramphenicol is an antibiotic useful for the treatment of a number of bacterial infections. This includes use as an eye ointment to treat conjunctivitis. By mouth or by injection into a vein, it is used to treat meningitis, plague, cholera, and typhoid fever. Its use by mouth or by injection is only recommended when safer antibiotics cannot be used. Monitoring both blood levels of the medication and blood cell levels every two days is recommended during treatment. Rocky Mountain spotted fever (RMSF) is a bacterial disease spread by ticks. It typically begins with a fever and headache, which is followed a few days later with the development of a rash. The rash is generally made up of small spots of bleeding and starts on the wrists and ankles. Other symptoms may include muscle pains and vomiting. Long-term complications following recovery may include hearing loss or loss of part of an arm or leg. Colorado tick fever (CTF) is a viral infection (Coltivirus) transmitted from the bite of an infected Rocky Mountain wood tick. It should not be confused with the bacterial tick-borne infection, Rocky Mountain spotted fever. 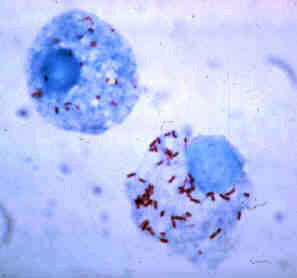 Rickettsia rickettsii is a gram-negative, intracellular, coccobacillus bacterium that is around 0.8 to 2.0 micrometers long. R. rickettsi is the causative agent of Rocky Mountain spotted fever. R. rickettsii is one of the most pathogenic Rickettsia strains. It affects a large majority of the Western Hemisphere and small portions of the Eastern Hemisphere. Murine typhus is a form of typhus transmitted by fleas, usually on rats. Murine typhus is an under-recognized entity, as it is often confused with viral illnesses. Most people who are infected do not realize that they have been bitten by fleas. Erythema migrans refers to a rash often seen in the early stage of Lyme disease, and can also be caused by southern tick-associated rash illness (STARI). It can appear anywhere from one day to one month after a tick bite. This rash does not represent an allergic reaction to the bite, but rather an actual skin infection of one of the Lyme bacteria species from the genus Borrelia. Howard Taylor Ricketts was an American pathologist after whom the Rickettsiaceae family and the Rickettsiales are named. A spotted fever is a type of tick-borne disease which presents on the skin. They are all caused by bacteria of the genus Rickettsia. Typhus is a group of similar diseases also caused by Rickettsia bacteria, but spotted fevers and typhus are different clinical entities. A rickettsiosis is a disease caused by intracellular bacteria. Hyalomma is a genus of hard-bodied ticks common in Asia, Europe, and North Africa. They are also found in Southern Africa. Southern tick-associated rash illness (STARI) or Masters' disease is an emerging infectious disease related to Lyme disease that occurs in southeastern and south-central United States. It is spread by tick bites, but the organism that causes the infection is unknown. The brown dog tick, commonly called kennel tick, or pan-tropical dog tick, is a species of tick which is found worldwide, but more commonly in warmer climates. This species is unusual among ticks in that its entire life cycle can be completed indoors. 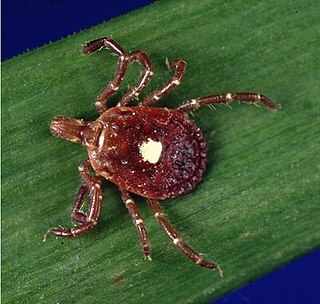 African tick bite fever (ATBF) is a bacterial infection spread by the bite of a tick. Symptoms may include fever, headache, muscles pains, and a rash. At the site of the bite there is typically a red skin sore with a dark center. Onset usually occur 4–10 days after the bite. Complications are rare, however may include joint inflammation. Some people do not develop symptoms. North Asian tick typhus, also known as Siberian tick typhus, is a condition characterized by a maculopapular rash. Flea-borne spotted fever is a condition characterized by a rash of maculopapules or furuncles. Kemerovo tickborne viral fever is an aparalytic febrile illness accompanied by meningism following tick-bite. The causative agent is a zoonotic Orbivirus first described in 1963 in western Siberia by Mikhail Chumakov and coworkers. The virus has some 23 serotypes, and can occur in coinfections with other Orbiviruses and tick-transmitted encephalitis viruses, complicating the course of illness. Rodents and birds are the primary vertebrate hosts of the virus; Ixodes persulcatus ticks are a vector of the virus. Kemerovo and related viruses may be translocated distances in the environment by migratory birds. 1 2 Rovery C, Brouqui P, Raoult D (2008). "Questions on Mediterranean Spotted Fever a Century after Its Discovery". Emerg Infect Dis. 14 (9): 1360–1367. doi:10.3201/eid1409.071133. PMC 2603122   . PMID 18760001. ↑ Conor, A; A Bruch (1910). "Une fièvre éruptive observée en Tunisie". Bull Soc Pathol Exot Filial. 8: 492–496.